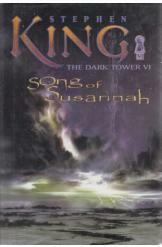 Song of Susannah by Stephen King, Sci Fi. Susannah has been captured by minions of the Crimson King and brought to a hidden fortress somewhere in the multiverse, where she will be forced to give birth to a creature prophecized to destroy Roland. Roland must rescue her, while haunted by premonitions of the doom of himself and his ka-tet. Book six of "The Dark Tower" series.